Editor’s note: Jan. 15, 2019, marks the 100th anniversary of the day Rosa Luxemburg and Karl Liebknecht were murdered by the bloody forces that suppressed the 1918-19 German Revolution. To highlight how Luxemburg’s revolutionary life and thought are pertinent today, we present a critical review by Raya Dunayevskaya of The Letters of Rosa Luxemburg, edited and with an Introduction by Stephen Eric Bronner (Westview Press, 1978; new edition by Humanity books, 1993). The review originally appeared in the August-September 1979 issue of News & Letters, and can be found in The Raya Dunayevskaya Collection, #7041. It is this other tradition—revolutionary in the most total sense, that is to say, in its opposition against both capitalism and the reformist deviation within the revolutionary movement—that would have been easier to grasp if the readers had not to confront letters from 1894 to 1919 in one lump sum without a single distinction other than the year’s date at the top of each page. It is true that Professor Bronner’s substantive Introduction situates Luxemburg in the context of her era. But it is only natural that readers turning to The Letters of Rosa Luxemburg would want to hear her in her own words and sense the direction of her thoughts, actions, development before they have reached the 200th page of those letters. It is true she used the expression “heroism of the masses” to describe the magnificent actions of the Warsaw workers in the first Russian Revolution, 1905, whereas this collection of letters begins in 1894, with a letter of Luxemburg to her colleague and lover, Leo Jogiches, in which she complains that his letters are wholly devoted to the “Cause” and tell her nothing of him personally or of the organizational and factional differences with the Russians. But it is even more true that, from the very start of her break with bourgeois society—when she was only a teenager, yet was already under police surveillance and had to leave Poland for Switzerland, where she met her life-long collaborator Jogiches—“the heroism of the masses” was precisely what won her commitment to the revolutionary movement. She never veered from that for a single moment. However, whereas that 1894 letter from Paris spoke so personally and very nearly “obediently,” all one has to do is read the very next set of letters, as she reached Germany in 1898, to see a quite different Luxemburg. Not only does she take issue with Jogiches’ advice, but she reaches such immediate heights theoretically on the most burning question raging in the German Social Democracy—the very first appearance of reformism—that it is her analysis, Reform or Revolution, that is the most comprehensive and profound answer to Eduard Bernstein. It becomes a standard for all revolutionaries, and has remained so to this day. Rosa Luxemburg denounced the brutal 1903-07 German genocide against the Herero people in Southwest Africa. 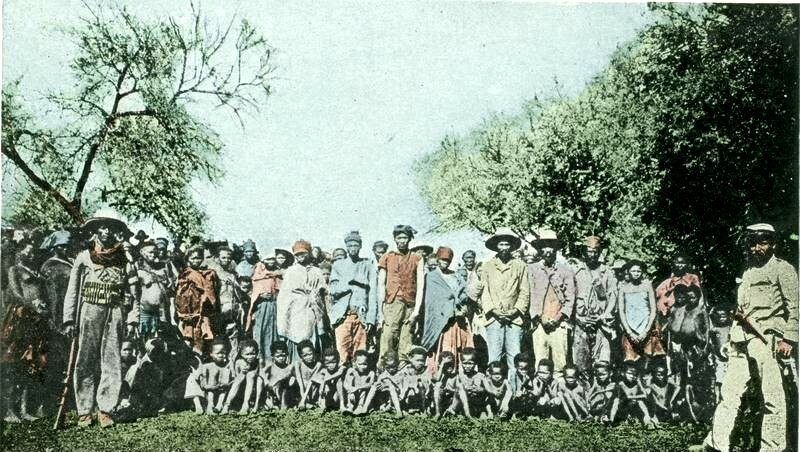 Above, Herero prisoners of war, including children. “From that, the European antagonisms in Africa have received new impulses; there, too, the struggle is breaking out with new force (Fashoda, Delegoa, Madagascar). It’s clear that the dismemberment of Asia and Africa is the final limit beyond which European politics no longer has room to unfold….the European powers will have no choice other than throwing themselves on one another, until the period of the final crisis sets in within politics…” (p. 72). The letter was dated Jan. 9, 1899! Naturally, no book review, much less subheadings, can do justice to the multiplicity of topics and years (1894-1919) covered in The Letters of Rosa Luxemburg; the first subheading made no such claim. It did, I hope, help point a direction, both as to the objective situation and the subjective developments in Luxemburg’s life. She no sooner set foot in Germany than she began the fight against reformism. Her “German period” ended long before World War I broke out and revealed the betrayal of the German Social Democracy. 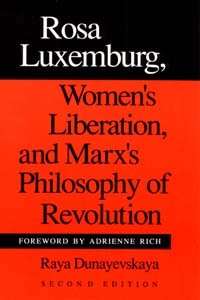 Ever since the first Russian Revolution, 1905-06, when Luxemburg was still close to Karl Kautsky, she began to “speak Russian” as she described the “heroism of the masses”: “in all factories, committees, elected by the workers, have arisen ‘on their own,’ which decide on all matters relating to working conditions….the organization advances indefatigably. In spite of martial law…the work is being carried out just as if political freedom were already a reality” (pp. 114-115). By 1910 she broke completely with Kautsky. As she generalized her experience into the analysis of The Mass Strike, the Party, and the Trade Unions and worked to apply it in Germany, Karl Kautsky’s abstract revolutionism and his “theory of attrition” horrified her. She sensed his opportunism which would lead to betrayals. She called it “the servility of the theoretician” back in 1910. Just as her total break with Kautsky, four full years before the outbreak of war—long before anyone else, Lenin included, sensed any defect in the then most outstanding revolutionary—so her anti-war agitation in 1913 led the Kaiser to cite her “for treason,” before there was actual war. That was very far from all she did in that hellhole. Not only did she continue her leadership, theoretical and political, of the anti-imperialist war, and also produce a minor masterpiece of literary criticism of Korolenko (not to mention the constant flow of magnificent “personal” letters, especially to Mathilde Wurm, when she suddenly calls upon Penthesilea, the queen of the Amazons). No, she was also involved in strict theory, the phenomenal Anti-Critique, directed against the critics of her greatest theoretical work, Accumulation of Capital; they are, in fact, a single work. Unfortunately, as her letter to Hans Diefenbach discloses, her rage was directed not alone against those she called “Marx’s epigones,” who took issue with her critique of Volume II of Capital, but even against “the famous first volume of Marx’s Capital, with its profuse rococo ornamentation in the Hegelian style” (p. 185). None of this, however, diverted in any way from what dominated her whole life, in theory or practice, in or out of prison: REVOLUTION. Even in criticism, for example, her praise of the Russian Revolution and the Bolsheviks under the leadership of Lenin and Trotsky “who dared” was unequivocal. Above all, there was the unending preparation for, and finally actual participation in, the German Revolution which finally freed her from prison. Because revolution was her life—or, as she expressed it: “The Revolution is magnificent; all else is bilge”—the then-ruling Social Democracy wanted her dead. Where the Kaiser hadn’t succeeded, the Freikorps was incited to brutally murder her and throw her body into the Landwehr Canal. 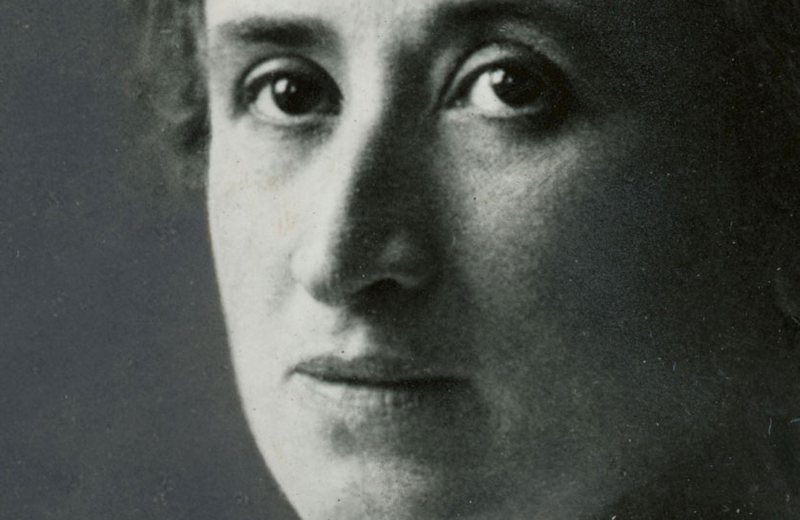 The Letters of Rosa Luxemburg ends with a letter in which she enclosed the first issue of Rote Fahne, organ of Spartacus League, transformed into the Communist Party, and calling for all power to the Workers’ and Soldiers’ Councils. It was dated Jan. 4, 1919. Within 11 days she was dead. But they could not kill her ideas. Her revolutionary legacy lives on; for no other generation does her life’s work bear as much relevance as for ours. This entry was posted in Articles and tagged 1905 Russian Revolution, 1919 German Revolution, Accumulation of Capital, Eduard Bernstein, German Social Democracy, imperialism, Karl Kautsky, Karl Marx, Leo Jogiches, Leon Trotsky, Raya Dunayevskaya, Reform or Revolution, Rosa Luxemburg, Rosa Luxemburg Women's Liberation and Marx's Philosophy of Revolution, Stephen Eric Bronner, V.I. Lenin, World War I. Bookmark the permalink.